March 22, 2014 (Campo) – What could be more romantic than a trail ride with wine and cheese tasting awaiting you at the trail’s end? On Saturday, April 12, a wine and cheese ride will begin at the Camp Lockett Event & Equestrian Facility at 799 Forrest Gate Road in Campo. The trail ride includes a tour of Gloriosa Vineyard, heavy hors d’heuvres and wine tasting. Ariele Johannsen hosts our popular “Destination East County”program on the East County Magazine Radio show. Our show airs Mondays, Wednesday and Fridays from 9 a.m. to 10 a.m. on KNSJ 89.1 FM. Destination East County is heard on Wednesdays and Fridays each week. April 1, 2014 (San Diego’s East County) –Spring is in the air this week, complete with spring festivals, baby animals, classical music, poetry and art, golf events, and more! Scroll down for details on many happenings in East County for you and your family. Ocotillo residents shared reactions to the surreal tilting turbine image, clearly indicating the townspeople’s sentiments about this project. March 31, 2014 (San Diego's East County)-- The search for David Marquez, 73, who was reported missing on March 27 and was last seen March 23 by family and friends, has ended with the discovery of his body yesterday morning by a San Diego Search and Rescue team. The deceased man was found about two miles from his vehicle, which was parked on the shoulder of Interstate 8 near the Crestwood exit. PHOTO OF THE WEEK: WHO'S TOP BANANA ON LET'S MAKE A DEAL? March 31, 2014 (San Diego's East County) -- Kathleen Hedberg is best known locally as an outspoken advocate for ratepayers on the Helix Water Board. But in February, Hedberg's outgoing ways--along with a bright yellow banana costume--caught the eye of Let's Make a Deal's host. Hedberg was chosen as a contestant on the popular TV game show's 50th anniversary airing -- and won a gleaming new 2014 Chevrolet Spark car for her "a-peeling" efforts. Read more about PHOTO OF THE WEEK: WHO'S TOP BANANA ON LET'S MAKE A DEAL? Update March 31: The victim has been identified as Jordan Janway, 27. Janway is the brother-in-law of NASCAR racing champion Jimmie Johnson and sister to Johnson's wife, Chandra. March 30, 2014 (Otay Mesa) –A skydiving instructor in his 20s is dead after colliding with another skydiver this afternoon. He may have been knocked unconscious and his parachute never opened. He was reported missing, prompting a search of the Otay area by Sheriff's deputies, Border Patrol agents, Cal-Fire firefighters and approximately 20 skydiving volunteers. The Sheriff's A.S.T.R.E.A. helicopter also responded and located the missing skydiver's body. Ironically, a device that could have saved his life had reportedly been sent out for maintenance. A master parachutist and rigger with more than 1,000 jumps on record, he usually carried a device to automatically open his parachute in the case of emergency. Update: Anderson casts lone vote against suspension of Yee, calls for expulsion from Senate instead. March 30, 2014 (Sacramento) – Capitol Hill is reeling over charges against Senator Leland Yee alleging corruption and conspiracy to smuggle firearms. The FBI evidence reportedly includes Yee caught on tape setting up a meeting with an arms broker for an undercover agent, as well as ties to organized crime leader Raymond Chow, better known as Shrimp Boy. March 30, 2014 (La Mesa)--The Cheese Crisp Special was popular among Casa de Pico customers from the first day it was served in 1971. Diane Powers, owner and operator of Bazaar del Mundo Shops and the Bazaar del Mundo Restaurant Group, wanted to create a unique signature dish. The 40-year-old recipe consists of a crisp flour tortilla, topped with refried beans, two kinds of beef or shredded chicken, melted cheese, fresh avocado slices, tomato wedges, guacamole and sour cream. “It’s popular because you taste lots of our Mexican flavors,” said Manager Lino Rodarte. The Cheese Crisp Special originated at Casa de Pico, which has since relocated to La Mesa’s Grossmont Center. It can also be found at all Powers’ restaurants – Casa Guadalajara in Old Town, Casa de Bandini in Carlsbad, and Casa Sol y Mar in Del Mar Highlands. Exclusive to East County Magazine, Casa de Pico has shared its signature Cheese Crisp Special recipe below. March 31, 2014 (San Diego)—Monday, March 31st is Cesar Chavez Day in California and seven other states. It commemorates the birthday of the tenacious farm workers’ organizer and civil rights leader. Now, 21 years after Chavez’ death, a petition drive has been launched asking President Barack Obama to declare March 31 a national day of service. You can view or sign the petition here: http://www.takepart.com/chavez/petition. In addition, a new movie , Cesar Chavez: History is made one step at a time, debuted this past weekend in theaters across the nation, including locally in San Diego and East County. The movie documents Chavez’ courage amid turbulent times as he fought for a better way of life for farm workers and their families. View a trailer here: http://www.fandango.com/movie-trailer/cesarchavez-trailer/168951. March 29, 2014 (San Diego) - The San Diego Advertising Fund for Emergencies (SAFE), a volunteer, non-profit organization (501c3) providing confidential financial assistance to local advertising and marketing professionals and their families facing a life crisis emergency, will host its 13th annual fundraising party from 6 to 9 p.m. on Thursday, April 3, at the Ivy Rooftop Lounge atop the Andaz Hotel, 600 “F” St., in the Gaslamp District in Downtown San Diego. March 30, 2014 (San Diego's East County)--Friends of East County Arts, Inc. presents its 19th Annual Garden Tour on Saturday, April 26 from 9 a.m. to 3 p.m.
March 28, 2014 (San Diego)--For the second time in about six months, the San Diego County Water Authority has received several reports of scam artists attempting to mislead homeowners by telling them their water is polluted and offering to test it. There are no water safety problems in the Water Authority’s service area. March 29, 2014(Ramona) The Ramona Valley Vineyard Association (RVVA) elected Vintner Micole Moore, of Ramona Ranch Winery to serve as President of the Ramona Valley Vineyard Association for 2014. The RVVA represents nearly100 vineyards and wineries, with the Ramona Valley AVA recently named the fastest emerging wine-region in California. Located approximately 35 miles NE of San Diego, the Ramona Valley is nestled in the front range of the Pacific coastal mountains of Southern California and has a rich history of vineyards and wine making, dating back to the early missions. Hot days and cool nights, influenced by the coastal marine layer and fog, contribute to conditions that produce quality wine grapes in the Ramona Valley. Update March 30, 2014: All four of these individuals made Saturday's cut and are now in the top 30 finalists. March 29, 2014 (San Diego)--The San Diego Padres have been holding announcer try-outs for the last several weeks. Almost 800 candidates were given a shot. It looked as if American Idol was in town. All contestants received a script as judges listened in an undisclosed location in Petco Park. Deamers, professional broadcasters, and writers were in the mix to try and become the new voice of the San Diego Padres. The top 50 contestants have been notified and this will be cut down to 30 later today. The final announcement of the winner and new voice of the San Diego Padres will be announced on April 18, 2014 when the Friars take on the San Francisco Giants. Many success stories have come through East County, including professional ball players, actors-- and now four lucky contestants who made the top 50 from our own East County: Allen Wilde, Doug Herman, and Patrick Connor. of El Cajon and Randy Mann of La Mesa. APRIL 5 AT UCSD: "HOW TO PLAN FOR, GET INTO AND PAY FOR COLLEGE"
March 29, 2014 (San Diego)--UC San Diego is offering “College Prep For Future Tritons,” a free event on campus for middle and high school students and their families to learn how to plan for, get into and pay for college. Emphasizing that it’s never too early to think about college, the Saturday, April 5 event offers information about the college prep necessary so that qualified students who want to go to college can, regardless of income or ethnicity. Read more about APRIL 5 AT UCSD: "HOW TO PLAN FOR, GET INTO AND PAY FOR COLLEGE"
March 29, 2014 (San Diego)--I always look forward to the next Caitlin Rother novel, as she seems to never disappoint. Rother’s I’ll Take Care of You may very well be her best and most incisive to date. This New York Times bestselling author has followed up on her riveting and controversial true crime novel, at least locally; Lost Girls, with another true crime novel that will not let you put the book down; I’ll Take Care of You. I found myself being more engrossed in being an avid reader, than actually a book reviewer. Nadin Abbott contributed to this report. 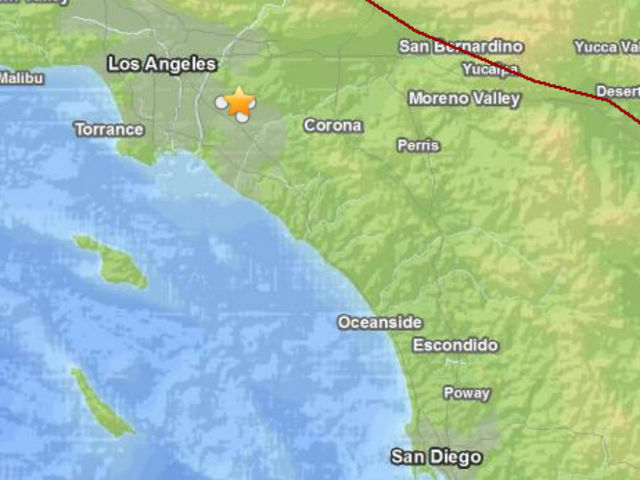 March 29, 2014 (San Diego’s East County) – A 5.1 earthquake centered in La Habra in Los Angeles County rattled southern California shortly after 9 p.m. last night. It was initially reported by the U.S. Geological Survey as a 5.4 shaker but later downgraded to 5.1. No damage has been reported locally . In Anaheim, rides were stopped at Disneyland as a precaution. Gas leaks and water line breaks were reported in some portions of Los Angeles and Orange Counties. The Los Angeles Times reports that about 50 people are displaced in Fullerton, though overall damage has been minor. March 27, 2014 (La Mesa) -- The La Mesa-Spring Valley School District was able to refinance a portion of the Proposition M General Obligation Bonds saving $650,000. Much like a homeowner can refinance a home loan to obtain a better interest rate and lower their monthly mortgage payment a school district can refinance its bonds for a better rate and lower the bond cost to all property tax payers. March 28, 2014 (San Diego)--Attention, shutterbugs! Mission Trails Regional Park invites you to enter its 22nd annual Amateur Photo Contest. Continuing its series of exhibitions by outstanding U.S. artists, the San Diego County Library System will debut Vaqueros and Latitude 13: Images of Peru by Kentucky-based photographer Rhett L. Beck at a reception on Apr. 4 from 4:30 - 5:30 p.m. in the Lemon Grove Library, 3001 School Lane. March 28, 2014 (San Dieg) -- The Sheriff's Department, San Diego Regional Fugitive Task Force (FTF) and Crime Stoppers advise the public to be on the lookout for Robert Ranqul Nowlin. He is wanted on child endangerment, domestic violence and burglary charges. He has a tattoo on his right wrist with the letters "GD."